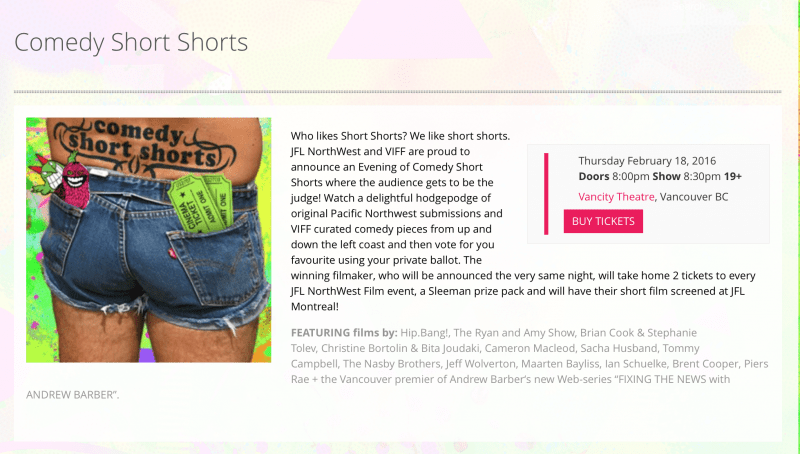 Caotica will be a part of the Just-For-Laughs NorthWest Comedy Festival, specifically the COMEDY SHORT SHORTS show. A selection of short films, sketches and webisodes from comedians working in the Pacific Northwest (particularly Vancouver) will be screened at Vancity Theatre. I mean, just look at the talent in this segment alone. This is the first year of the partnership between JFL and the former NorthWest Comedy Fest. A ten-day festival every February, audiences get their pick of stand-up, improv, sketch, and live podcasts from an enormous spate of international talent. JFLNW spotlights amazing local shows like Sidekicks, Hero Show, Hip.Bang, Vancouverite, and the Sunday Service, just to name a few. It also brings in huge stars such as David Cross, Margaret Cho, Ron Funches, Todd Barry, Bill Burr, and Daily Show host Trevor Noah. It’s that rarest gem of a comedy festival, the kind where you could pick a show at random, and never be disappointed. The only problem is there’s too much talent to ever see it all. We’ll make it easy for you by publishing our top 10 picks for the festival next week, but don’t be surprised if COMEDY SHORT SHORTS ends up #1. This show consistently sells out, so buy those tickets now.